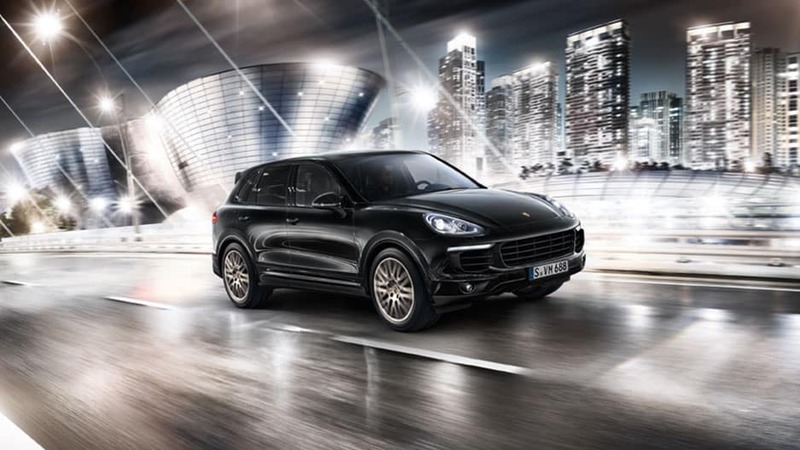 The new Porsche Cayenne offers the versatility of a crossover with the adrenaline-pumping power you expect from Porsche. Forget everything you thought you knew about luxury crossovers. 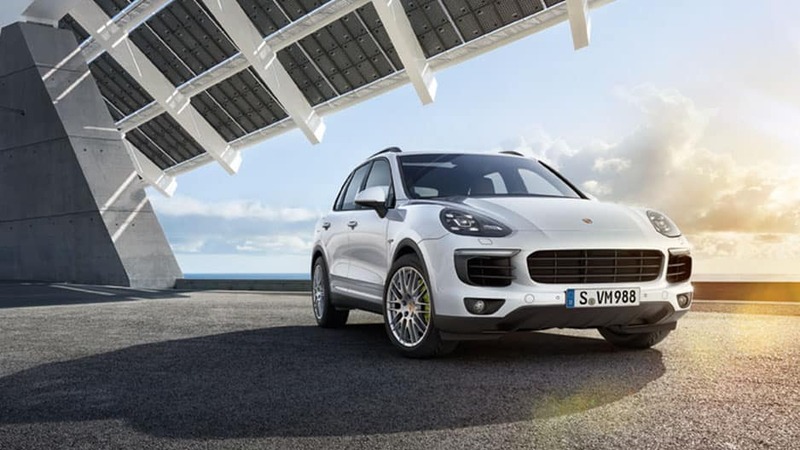 The new Porsche Cayenne has arrived and is taking the midsize crossover segment by storm. 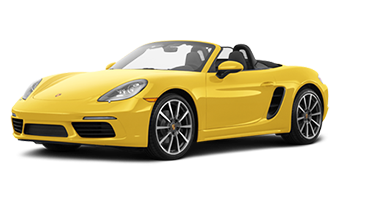 Porsche crafted this elegant beauty with the brand’s sports car heritage in mind, including sleek lines, sculpted body panels, and a bold three-piece air intake on the grille. Slip behind the wheel and discover a cockpit built around the driver with available heated leather seats, an ascending center console, and touch-sensitive function buttons. 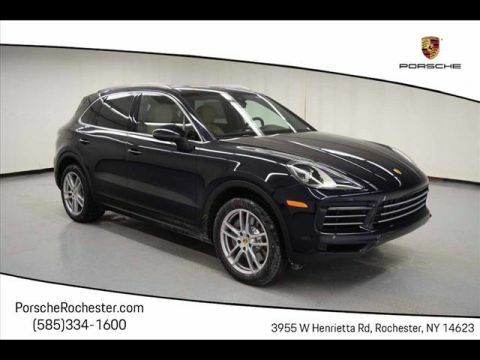 Whether you’re carpooling to Webster, dropping the kids off in Fairport, or meeting friends in Irondequoit, the new Porsche Cayenne always leaves a lasting impression. Porsche didn’t achieve fame just for its good looks; it earned that recognition through incredible performance. The new Cayenne is no exception with its variety of engine options, including a 4.0-liter twin-turbocharged V-8 that sprints this crossover to 60 mph in under four seconds. Combined with the tight handling provided by the Porsche Dynamic Chassis Control and quick stopping power of the Porsche Ceramic Composite Brakes, this innovative crossover makes every drive feel like a race around the track. 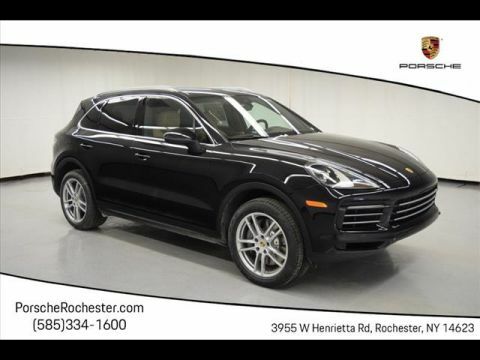 Experience the new Porsche Cayenne for yourself by scheduling a test drive with Porsche Rochester today. From the moment you lay your eyes on it, the new Porsche Cayenne demands your undivided attention. 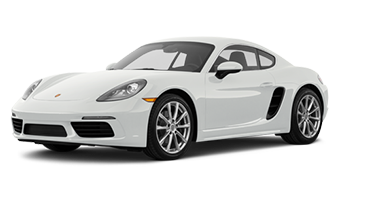 This midsize crossover is every bit Porsche with its dynamic styling, LED lights, and eye-catching wheel designs. Porsche’s sports car design cues are clear from every angle of the new Porsche Cayenne. This luxury crossover features a sharp, sleek roofline, muscular body panels, and sculpted front-end, ensuring it stands out in any crowd. Light up the night in the Porsche Cayenne with LED headlights that cast bright light further down the road than traditional halogen bulbs. In the rear, you’ll discover the Cayenne’s elegant LED taillights in the form of a striking strip across the back, so cars traveling behind you can’t miss you. Not only does the new Porsche Cayenne offer an array of wheel options, it also features staggered wheels that are 1.3 inches wider in the rear.. 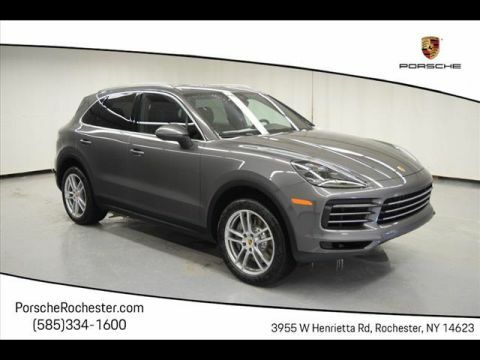 The new Porsche Cayenne comes in many colors, so whether you prefer Biscay Blue, Mahogany Metallic, or Quartzite Grey, you can match your Cayenne to your personality. Announcing your arrival everywhere you go are the Porsche Cayenne’s three-piece air intakes on the front-grille. Large and dominant, these air intakes command respect, while also boosting overall performance. 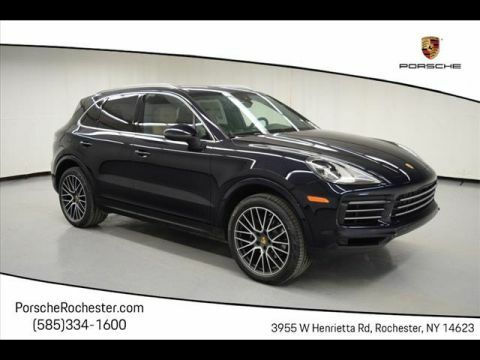 The new Porsche Cayenne boasts the luxury refinement you expect from a Porsche while offering the space you need to carry up to five people and all their things. Load up and head out on your next adventure surround in elegant style. Slip behind the wheel of the new Porsche Cayenne and discover an interior built with the driver in mind. This midsize crossover offers heated sport seats for superior comfort and support, while an ascending center console provides a short distance between the steering wheel, gear selector, and touch-sensitive function buttons. Choose from several premium materials, including genuine leather, carbon fiber, and real wood, for a luxurious interior that compliments the outside. Bring more along for the ride in the new Porsche Cayenne. Lower the split-folding second-row seats and reveal up to 60.4 cubic feet of available cargo room so you can easily accommodate your luggage, golf clubs, or latest shopping haul. Brighten your morning drive in the new Porsche Cayenne with the panoramic roof system. This system adds a two-panel glass sunroof that raises and opens with the push of a button. 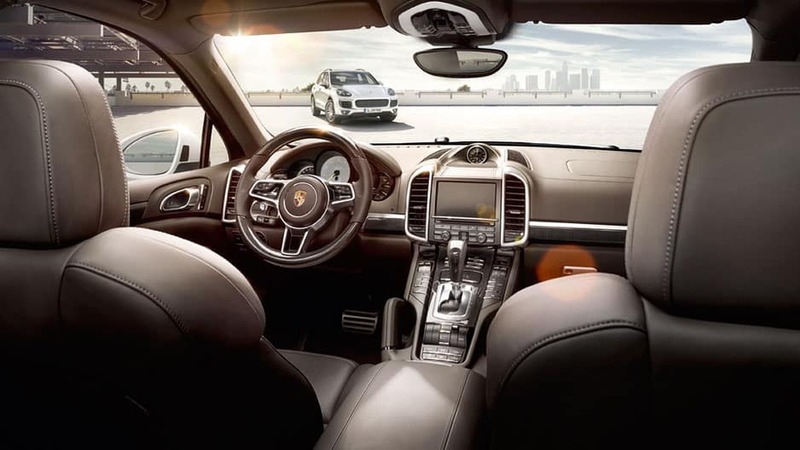 Everyone rides comfortably in the Porsche Cayenne courtesy of the four-zone automatic climate control. With this system, you, the front passenger, and the rear passengers choose individual temperature settings so everyone is as hot or cool as they like. 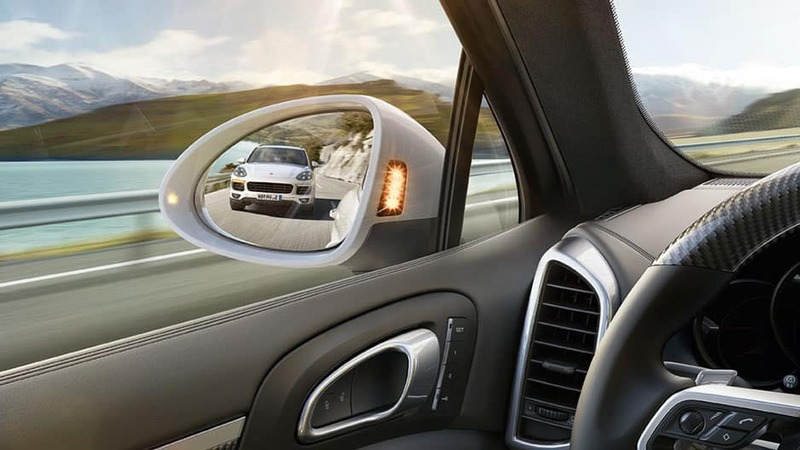 The new Porsche Cayenne eliminates headlight glare from vehicles traveling behind you with its auto-dimming rearview mirror. When the mirror detects bright light, it automatically dims so you can continue to drive safely. 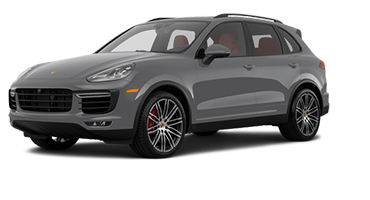 Never miss a beat in the new Porsche Cayenne thanks to a plethora of advanced tech features. This innovative crossover offers features such as Porsche Communication Management, Burmester® High-End Surround Sound, and Porsche Connect apps to keep you connected on the go. Sync your mobile device to the Porsche Communication Management system and enjoy easy access to your favorite apps right on the 12-inch touchscreen. Answer calls and texts hands-free, navigate unknown cities, or play your favorite tunes without picking up your phone. Turn the Porsche Cayenne into an audiophile’s dream with the Burmester High-End 3D Surround Sound system. This system surrounds you with crystal-clear, concert-quality sound with its 21 speakers and an active subwoofer. The Porsche Cayenne’s available Head-Up display allows you to keep important driving information such as current speed, driving mode, and navigation front and center with an adjustable projection on the windshield. With the Porsche Connect app, you can use your compatible smartphone or Apple Watch® to access important vehicle information and functions from virtually anywhere. Check your fuel level, retrieve stats from your latest drive, and even ensure you closed the doors and windows, right from your phone. Keep your rear passengers entertained on long drives with the Porsche Rear Entertainment system. This system provides two 10-inch anti-glare touchscreen displays attached to the front seatbacks, USB and HDMI ports, and 16 GB of internal memory so you can access thousands of apps and movies through any wireless hotspot. Wherever the road takes you, you can rely on the new Porsche Cayenne to help keep you and your precious cargo safe. This state-of-the-art crossover offers the latest in advanced safety features, including Adaptive Cruise Control, Lane Keeping Assist, and Surround View Camera. The new Porsche Cayenne’s Adaptive Cruise Control uses radar technology to detect and monitor vehicles traveling ahead of you. When you approach a slower vehicle, the Cayenne slows down to maintain a preset distance. Once the system no longer detects that vehicle, the Cayenne accelerates back to the preset cruising speed. On roads with defined markings, the Porsche Cayenne’s Lane Keeping Assist system helps you stay in your lane. If it detects unintentional lane drift, it will adjust to pull you back into your lane. This system helps you detect and prevent potential collisions with a front-end camera that monitors traffic, pedestrians, and cyclists ahead, alerting you if a front-end collision is imminent. If you don’t slow down quick enough, the system will apply brake pressure to lessen the impact. The Porsche Cayenne takes the uncertainty out of nighttime driving with Night View Assist. This system uses an infrared camera to detect and warn you of pedestrians or larger animals before your headlights reach them. 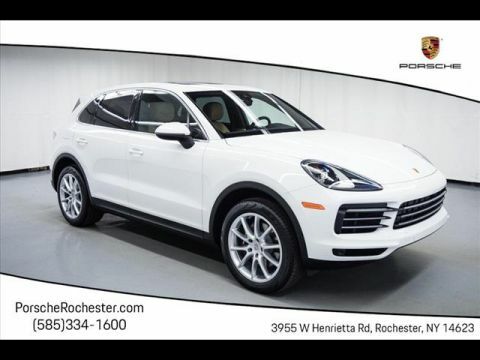 Using four cameras located in the front, back, and sides, the Porsche Cayenne’s Surround View Camera paints a bird’s-eye view of the surrounding area on the 12-inch display screen, so reversing and parallel parking is a breeze. Take a peek under the new Porsche Cayenne’s hood and discover an engine worthy of any sports car. It’s not all just about power though — it’s about how you use it, and this midsize crossover has the innovations to turn every drive into a thrilling ride. 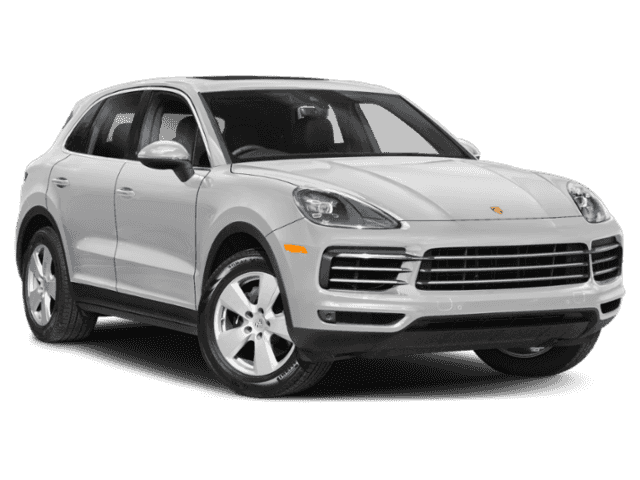 The new Porsche Cayenne offers a variety of adrenaline-pumping engines to choose from, including a 4.0-liter twin-turbocharged V-8. This engine delivers 541 horsepower and takes you to 60 mph in only 3.9 seconds. Adaptive Air Suspension adjusts the Porsche Cayenne’s spring rate to accommodate various terrain, ensuring a comfortable ride and improved driving dynamics. The system also allows you to adjust the Cayenne’s ride height so you can easily lower and load the cargo area. 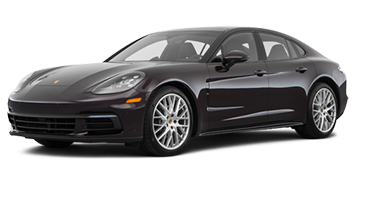 Opt for the available Porsche Ceramic Composite Brake and enjoy responsive and consistent braking. Up your driving performance with the Porsche Cayenne’s optional rear-axle steering. At low speeds, this system turns the rear tires in the opposite direction of the front tires, providing increased agility and a smaller turning circle. At higher speeds, they move in the same direction, increasing stability. Enjoy tighter handling on the Porsche Cayenne courtesy of the Porsche Dynamic Chassis Control. PDCC is an active roll-stabilization system that detects the lateral inclination of the Cayenne around corners and across uneven terrain. 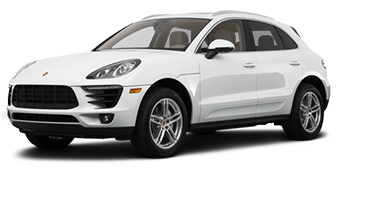 By suppressing the inclination, the Porsche Cayenne experiences improved performance and stability. Load up and head out on your next adventure in the new Porsche Cayenne. This innovative midsize crossover offers all the space you need to bring everyone and everything along for the ride. Lower the split-folding bench seat and expose up to 60.4 cubic feet of cargo room to play around with. 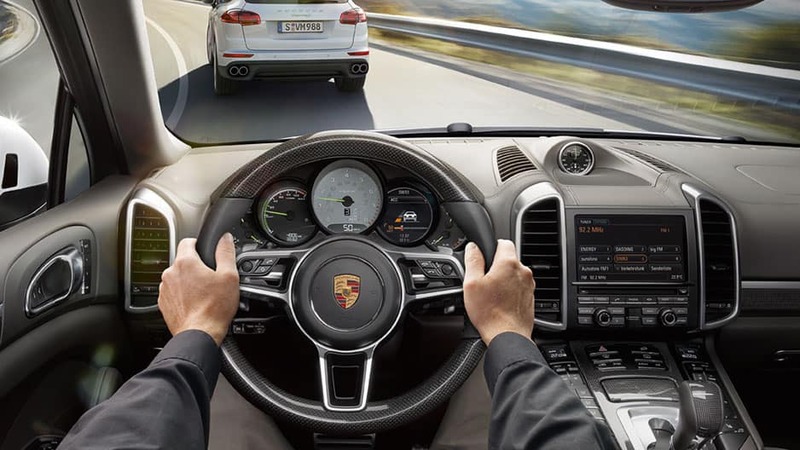 And for those longer trips, Porsche keeps you connected on the go with the Porsche Communication Management System. Sync your mobile device and enjoy your favorite apps, music library, and even hands-free calling right from the 12-inch touchscreen. And for your rear passengers, there’s the Porsche Rear Seat Entertainment system to keep them entertained, ending the slew of “Are we there yet?” questions. All this and more is waiting for you in the new Porsche Cayenne. 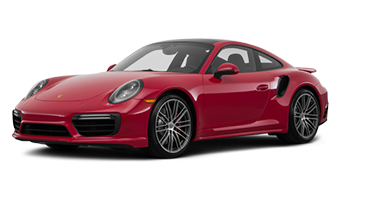 Schedule your test drive today with Porsche Rochester.